With fall right around the corner, I am already thinking of some of our favorite fall favorites and we love just about anything “pumpkin” around here. 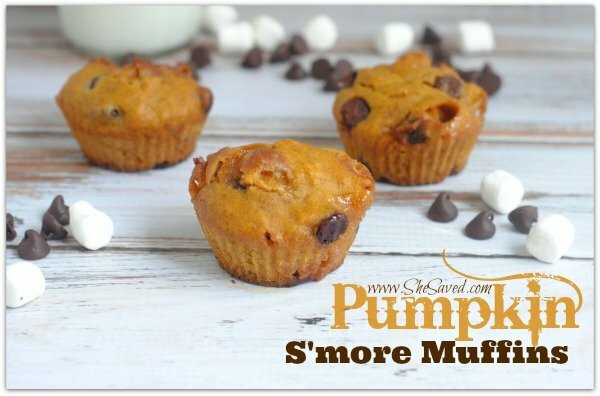 If you do too, then these Pumpkin S’more Muffins will be a great addition to your fall baking line up. Preheat the oven to 350 degrees and grease and flour 2 loaf pans. #1. Combine all the wet ingredients – pumpkin, oil, sugar, vanilla and eggs. Mix well. #2. Slowly fold in the dry ingredients – flour, baking soda, salt, baking powder and cinnamon. Mix well. Slowly fold in the chocolate chips and the marshmallows. #3. Pour the pumpkin batter evenly between the 24 muffin tins. #4. Bake for 20­-25 minutes. The muffins will turn light golden brown. #5. Remove the muffins from the oven and let cool. *Makes approximately 24 servings. 1 muffin = 1 serving. Store in an airtight container up to 1 week. I have also frozen these muffins and they do great, which makes for really easy grab and go breakfasts on the run! Enjoy!